She was class valedictorian and dreamt of making the world a better place, instead Joy is in a dead-end job, and at the mercy of the needs of her family. 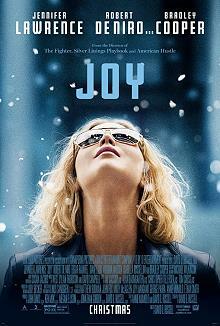 But Joy is a inventor and gives her dreams one more try. Joy (Jennifer Lawrence) is the quiet, pretty woman behind the counter that people abuse. Joy is the daughter of a mother(Virginia Madsen) who took to her bed (and soap operas) when her husband left. 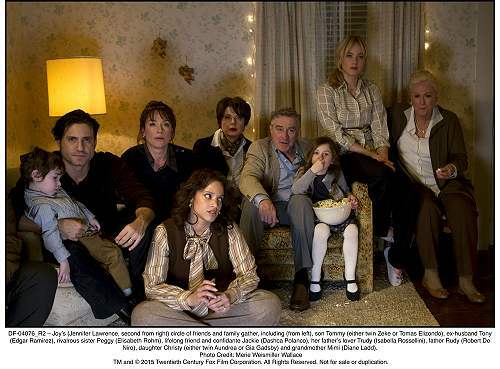 Joy is the mother of two who allows her ex-husband (Édgar Ramírez) to live in the basement - and her errant father (Robert De Niro) too when his girlfriend returns him. 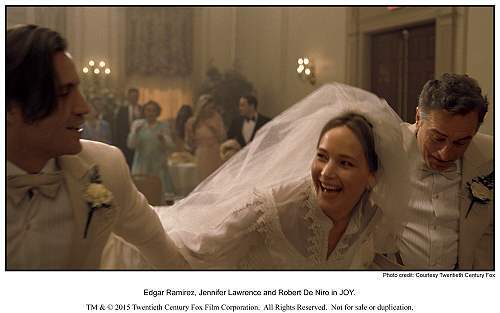 Joy has loyal friends in her ex-husband and Jackie (Dascha Polanco). She has a supporter too in her grandmother Mimi (Diane Ladd), but as the film opens, Joy is asking herself what happened in the 17 years since high school? Her life is bounded by the needs of others, and just when it all seems too much, she has an idea. Joy has invented a mop, and now she must contend with all that is involved in manufacturing and promoting her product. Once again Joy is tested. It is a testament to the director (David O. Russell) and the actors, including Isabella Rossellini as Joy's father's new girlfriend and a potential backer. Without lots of special effects and dramatic music, Joy gives us a real sense of what it is to be under familial pressure, and business pressure. We want Joy to succeed because she is a good person with a great gift. For this to happen she must dig into herself and find a new vision, and the determination to stand up to all the nay-sayers in the family, and all the pitfalls of business, and succeed.